Are nasty stains on the roof putting a real damper on your home’s curb appeal? Have organisms such as algae, lichens or moss feeding off the organic material up there? If so, you need to get the problem solved right away. The longer you wait, the more damage these organisms will case and you could end up with a real headache down the road. 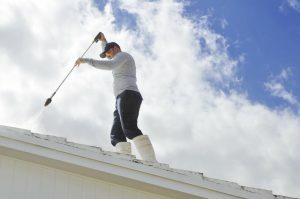 So, what’s the solution to getting rid of the stains and being on your way to a sparkling clean, brand new-looking roof? Similar to the stuff we use to wash our hair, roofs can be shampooed too! But you need to be careful when you choose a company to clean your roof. Lots of them use harsh chemicals that can pose a threat to people and pets. Or they use a strong power washer that can deteriorate shingles. That’s never the case when you choose North East Home Improvement! After soaking the roof and spraying our cleaning solution we give it a deep scrub then a light powerwash. It’s important to only lightly powerwash the roof because anything stronger will deteriorate the shingle, this can be a costly mistake and is why it’s important to have the right people power washing your roof. In need of new siding? We’re currently offering a FREE roof shampoo when fully redoing your siding so give us a call today at (203) 321-6695.